Pollution is the biggest menace to the living being in this planet today. Enzyme bioremediation is a “breakthrough technology” that holds the potential of pollutant eradication through exploiting the enzyme potential by using the various techniques. Enzyme biocatalysis is referred as white biotechnology and work by green chemistry concept. Moreover, developments in the design and application of enzyme cocktails, mutienzyme complexes, promiscuous enzymes and protein families (cupin and VOC superfamily) has recently emerged a new opportunity in bioremediation. The implementation of various enzyme modification approaches intended for potential bioremediation has been done by adopting enzyme immobilization using magnetic nanoparticles, designer enzymes generation through enzyme engineering, nano-technological advancement for single enzyme nanoparticle generations, electro-bioremediation and carbon nanotube construction. Hence, enzyme bioremediation have greater positive effects and propose significant promise to pollutant bioremediation. In conclusion, the enzymatic bioremediation open the new era of pollutant eradication for clean, safe and green environment. Environmental pollution is one of the serious issues of the present and future climatic scenario. The soaring environmental pollution affects the all forms of living and non-living globally. Environmental contamination has become a serious problem with the advancement of industrial revolution in developed and producing nations. The increasing population growth and urbanization stretch the use of innate resources for the maximum yield. The carrying capacity of the earth is significantly smaller than the demands with increasing populations. To satisfy the existing demands, the overuse of natural resources often results in nature’s degradation (Santos, 1990). The new agricultural practices have been carried out to meet the food demand of soaring population. Pesticides play a significant part in modern agriculture to increase the productivity. However, pesticides may have a good effect on agricultural productivity, conversely, their indiscriminate use in these farming practices has contributed to serious concern for the health of living being and the environment. (Diez, 2010; Coutinho et al., 2005). Pesticide poisonings are a massive problem worldwide, especially in developing countries. Out of the million tons of pesticides applied annually, most of them get accumulated in the environment with the degradation of only a small fraction (Eerd, Hoagland, Zablotowicz, & Hall, 2003). Pesticides are recalcitrant and remain for a long time in soils and enter directly into the food chain. To overcome these problems researcher has released the new degradable pesticides. The fate of pollutant in the environment is influenced by biological, chemical and physical degradation processes which determine their persistence and mobility (Gavrilescu, 2005). Consideration of the current technology for removal of pollutants clearly shows that physical and chemical methods are often uneconomical. Nevertheless, biological treatment technology may provide a resolution to this problem. The pollutant degradation by biological means such as microorganisms (Microbioremediation) or plant (Phytoremediation) etc. 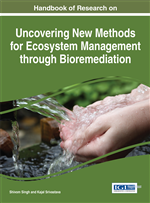 is termed as “Bioremediation”. The use of bioremediation technologies provides a dependable and economic alternative to commonly used physical and chemical handling. Biological remediation is regarded as the most dependable, least disruptive and most cost-effective treatment method (Mueller, Cerniglia, & Pritchard, 1996). Principle of bioremediation is to utilize the pollutants, use them for their growth and metabolism or convert them from toxic to nontoxic form. Bioremediation by microorganism offer more advantage over phytoremediation as microbioremediation is a well established technology for the pollutant removal. Simultaneously, microbes act as an ‘eco-friendly nano-factories’ for environmental cleaning. Microbioremediation offers natural, environmentally friendly and economical solution for environmental cleaning (Vidali, 2001). Bacteria and fungi are well known to degrade hazardous organic contaminants to environmentally less toxic or nontoxic compounds. These organic compounds are readily incorporated into the microbes and get oxidized under aerobic or anaerobic conditions. Heterotrophic bacteria and fungi are the chief agents causing biodegradation. Recently, genetically modified microorganisms have been directed to formulate bioremediation (Paul, Pandey, Pandey, & Jain, 2005). The Pseudomonas fluorescens HK44 possesses a naphthalene catabolic plasmid is the first genetically engineered microorganism approved for bioremediation testing (Ford, Sayler, & Burlage, 1999). The major problems associated with microbioremediation is the mass transfer, additionally they also require aeration and nutrient on contaminated sites (require bio-stimulation) and also suffer from thermal condition problems (Fantroussi & Agathos, 2005; Scow & Hicks, 2005). Now a day the bioremediation is shifted from microbes to enzymes because of their eco-friendly attributes. The pollutant degradation by an enzyme is known as “enzymatic bioremediation” and particularly suited for rapid remediation. This method is adventitious over to microbial bioremediation (either natural or genetically engineered microbes), because of the efficiency, time consumption and expense (Ahuja, Ferreira, & Moreira, 2004). The exploited enzyme potential using the various techniques of in-vitro enzyme evolution is being revolutionized in present scenario. The enzymatic bio-efficiency can be appraised by the adoption of two recent methods Biostimulation and Bioaugmentation (Sutherland, Russell, & Selleck, 2002; Scott et al., 2008). Biostimulation provides the optimal environment to enzymes or microbes for their maximum efficiency” in terms of temperature, pH, moisture, aeration, etc. (Baker & Herson, 1994), however “Bioaugmentation employ the superior biodegradable agent (enzymes or microbes) for the environment cleaning” (Scragg, 2005). Enzymes are having narrow (chemo, region and stereo selectivity) or broad specificity and can be applied to a vast range of compounds effectively under extreme conditions. Moreover, the use of enzyme may present advantages over traditional technologies and represent a good alternative for overcoming most disadvantages related to the use of physical, chemical and biological degradation (micro/phytobioremediation) (Nicell, 2001; Gianfreda & Bollag, 2002; Gianfreda & Rao, 2008). All these characteristics render enzymes as eco-friendly catalysts and enzymatic techniques as environmentally friendly operations. Biomagnifications: The process which accumulates excessive concentration of any substance in an organism at higher level in food chain. White Biotechnology: Uses of enzyme or microorganism in various industries for the production of chemicals, pharmaceuticals, food ingredients, energy, paper and biofuels from renewable resources. Bioremediation: Technique which degrades the pollutant by biological means such as microorganisms (Micro-bioremediation), plant (Phyto-remediation), enzymes (enzyme-remediation), etc. Promiscuous Enzymes: Are the enzymes which can catalyze different side reaction in addition to the main catalytic reaction. Although, the promiscuous activity is quite less compared to the main catalysis reaction but this is an additional and significant attribute of enzyme for bioremediation. Enzyme Cocktails: The mixture or combination of different enzymes, which make it more effective and efficient for any catalytic reaction. Persistent Organic Pollutants (POPs): Are the organic compounds which are resistant to environmental degradation through chemical, biological and photolytic processes. Green Chemistry: Design of chemical products and processes that reduce or eliminate the generation of hazardous substances.